Since we don’t RV more than 2 weeks at a time in any given year, it makes no sense for us to buy one. We’re much better off renting. When you rent a motorhome, there are different considerations than when you buy one. Generally, you can go higher end when renting because while it may cost a bit more, the difference between a lower end motor home and high end when buying is astronomical. That said, we’ve only ever rented Class C motorhomes and they’ve served us very well. Maybe one day we’ll rent a Class A, but for now, the Class C is all the motorhome we need (there’s 4 of us). We’ve rented a motorhome 3 years in a row and surely will again. Our first trip was a monster 5,500 Km roundtrip to the Yukon (from Vancouver). The next two years we parked it at a campground at Shuswap Lake in British Columbia. All trips were very good but very different. When you drive daily, it’s a lot of packing and unpacking, but you also see a lot more. When parked for 12 days in a campground, it’s very relaxing; the motorhome serves as a cabin. After 3 years of renting a motorhome, I’ve learned a few things. Here’s what you should know. In fact, it can be more once you factor in gasoline, insurance and mileage. It all adds up, especially if you do a lot of driving. Our last trip where we parked it for the entire time came to about $250 CAD per might. That could get us an okay vacation spot somewhere. I’m not begrudging the cost though. You can hardly do better than stay at Provincial campgrounds. Ours was on the lake, had showers and the scenery was incredible. No hotel would offer what the campground did. Besides, kids love camping in RVs. Our first year we didn’t get any of the extras such as blankets, utensils, etc. Big mistake. Packing is a big job; anything you can do to minimize how much stuff you’re taking in and out is worth it. The second year we ordered up all the kits and it was fantastic. The blankets were fabulous and comfortable. The kitchen was fully stocked. We had everything we needed and didn’t have to pack it in and out (other than food and kids stuff). Renting an RV is like buying an airplane ticket or staying at a resort. The sticker price is just the beginning. On top of the sticker price is mileage (that’s not gasoline mind you). You need insurance as well (check if your insurance provider will cover the RV). And then you need to buy gasoline, which adds up big time. If you get the kits, that’s a few hundred more. I’ll say it again, renting a motorhome is not a cost-saving vacation. It’s expensive, but it offers several advantages you don’t enjoy at a resort, hotel or vacation home. I was a bit nervous at first, but it only took me 30 minutes to get in the groove. I limit lane changes. Once out of the city, it’s no problem. That said, backing into campsites can be very tricky, but I just took it super slow and made it unscathed. In British Columbia, motorhomes are totally booked by November for the following Summer. We got lucky our first year landing a cancellation. However, if you’re serious about renting a motorhome in the Summer, rent it as soon as you can. Europeans (especially Germans) love renting them so much that our local rental place has German-speaking employees. Our first year we got the Adventurer 4 because it has 4 seats in the cab. That way we could properly fasten child seats. The dinette seats were not built sufficiently to secure child seats. However, the next year there were Class C models that had a steel frame built in behind the dinette bench that could secure child seats and booster seats. This was an awesome development because we spent a lot of time the first year trying to figure out the safest option with two really young kids. In fact, we were astonished that until a couple of years ago, there really weren’t good options for securing child seats and most motorhomes only have 2 seats in the cab. The model with 4 seats in the cab is the Adventurer 4, which we rented the first time. It’s huge, powerful and we could secure our kids in the cab. However, it cost a lot more than a regular Class C; pretty much the cost of a Class A. It was also a hassle moving from the front passenger seat into the camper area. Nevertheless, it was worth it because our kids were properly secured the entire trip. When you rent you may not be familiar with RV-sized fridges and freezers. You probably have plans to bring a lot of food with you to minimize shopping trips. Don’t get too optimistic because the refrigerators and especially the freezer are not very big. You need to choose your refrigerated goods very carefully. That said, having a fridge is a luxury that tent camping doesn’t offer. This is another reason I’d be reluctant to buy a motorhome. Stuff breaks way too easily. Everything is constantly jostling on the road. Kids are rough. By the end of our Yukon trip the bathroom door broke off the rail and the TV snapped off the console. All that happened in only 2 weeks. I could only imagine how much would be broken in 2 years. You definitely need to budget for gasoline because it’s not cheap. If you’re driving and parking it somewhere, it won’t be too bad, but if you’re doing a cross-country trip, it adds up daily. When you rent, know approximately how many miles or kilometers you’ll be going so you can buy mileage packages instead of paying a la carte. The packages will save you money. While they cost $200 to $300 CAD per night in the summer, you can get them for $2,500 CAD for an entire month in the offseason. If you have flexibility and are going to warm climates, rent for an entire month in the offseason. When you do that, it’s definitely a cost-saving vacation. That works out to $125 CAD per night. They throw in mileage and kits as well. With the Class C you get a ton of storage underneath. We fit all sporting equipment, camping chairs, two kids bikes, propane tank, propane fire pit and more. There are a few other exterior storage compartments as well. Inside, we typically use the bathroom for storage because we don’t hook up water. I’d like to try a Class A sometime. I like the big sofa it offers, but our kids love the above-the-cab sleeping area so it may be a while. Besides, there are large Class C models with a sofa area too. The thing is Class A’s cost quite a bit more to rent than a Class C, so I’m pretty happy with the Class C for now. I suspect a Class C is a bit easier to drive too. FYI, there are other types of motorhomes you can rent as well. Just looking at a bump out you wouldn’t think they increase space all that much, but they really do. They widen the entire aisle and space by almost two feet which is huge given there isn’t much space to begin with. In fact, that’s one of the differences between a small and medium Class C (at least from where we rent). The small Class C doesn’t bump out whereas the medium-sized Class C does. The large Class C is a bit longer with a sofa and a bump out. 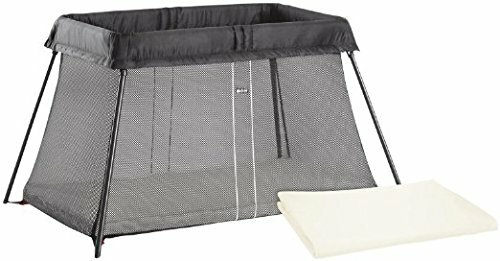 Baby Bjorn travel crib – this is awesome. If you have a baby, this important. With the wider aisle created from the bump-out, we can fit the Baby Bjorn crib in the aisle, which our youngest likes to sleep in. Although he’ll be in a bed the next trip. If you have a baby, this is good info because we weren’t sure it would fit when we rented our first motorhome. 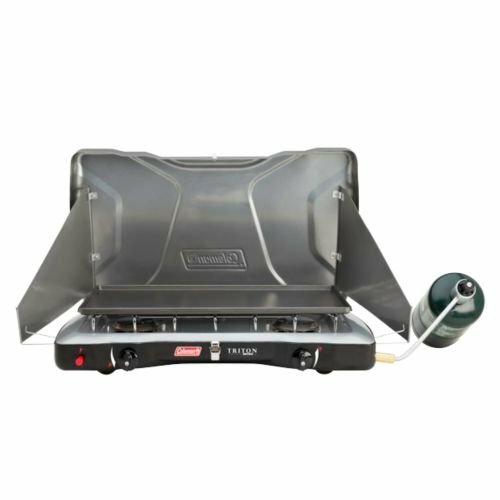 This type of stove is great to have when camping even if you have a motorhome with stove and oven. The oven works, but cooking in an RV isn’t the best. You’re cooped up inside in a small space with no counter space. It’s much nicer to cook outside on a Coleman stove and/or barbecue. We bought a Coleman stove for our last trip and it was the best piece of camping gear we ever bought. Coffee and all kinds of food was so easy to make outside. You don’t think about awnings until it rains. Then you love the awning. Most motorhomes have an awning. The ones that extend with the push of a button are best. TIP: When parking your motorhome, do so with the awning in mind. You want it so that your awning will cover where you want to sit. You can’t run AC constantly unless you run the generator. However, many campgrounds limit generators to a few hours per day (because they’re loud). This means you can cool your unit for a couple of hours, which is nice (and charge up devices), but that’s it. When you book your camping spot or before you do, inquire about generator use. It varies campground to campground. It’s good to know what to expect. As soon as you turn the AC off, it doesn’t stay cool very long. Fortunately, in British Columbia it doesn’t get too hot, but I imagine camping in Arizona or Florida in the summer you’d want to run the AC 24/7. Speaking of generators, motorhomes these days come with USB ports that can charge devices. I know, I know, camping is a time to disengage from screens; however, I do need some access for work to ensure there are no emergencies. Moreover, while camping it doesn’t hurt to watch a Neflix movie here and there especially if it’s raining. I think most people appreciate the USB ports for charging devices. I know we did. If you have a family you probably have some space needs in which case it might be worth going to the rental place and doing some walk-throughs. We did. We found it very helpful to plan our trip, especially the first one. We even measured for the crip. I think we had reserved it by that time, but as we were getting close to the planning and packing stages, we wanted to know exactly how much space we had for things. If you load it up with bikes, food, toys, sporting equipment, etc. leave an entire evening to unpack. Leave a bit more time to pack. Packing takes more time than you think. Our second year we foolishly thought we could drive home the same day it was due to be returned. Traffic was bad, my wife had to stuff everything in bags while on the road and then we had to dump everything out at my parents’ place who lived closer to the rental place. After all that we returned it late and paid a late return fee. Last year we picked it up the day before we left and returned the day before it was due back to the rental. It was a smooth packing and unpacking experience and we weren’t rushed on our drive home. Our first year we rented the Adventurer 4 which is a Ford F-550 Super Duty truck. This sucker was incredibly powerful and fast. We could go up huge hills like we were in our regular car. The last two years we went with a weaker Class C, but I had no complaints about the power. We weren’t beating Porsche’s or anything, but we could maintain the speed limit through mountain passes. I guess before renting motorhomes I recollected those on the road built in the 1980’s that are barely functioning and were underpowered when new. These days, the motors are plenty powerful. Many people from Europe (especially Germany) rent motohomes in British Columbia (perhaps other places too, but I know for a fact this is the case in BC). Those visitors don’t have the luxury of bring loads of camping gear with them. They come with suitcases and that’s it. However, the motorhome rental companies cater to fly-in renters by offering all the kits and gear they need including utensils, dishes, pots, bedding, firewood gear, camping chairs and much, much more. When you rent, be sure to check out the kits available because it can be a huge convenience, espeicially if you’re flying to the rental destination. Don’t count on drive-throughs to have enough clearance. The last thing you want to do is to get your RV stuck in a drive-through. While I haven’t done that with our rentals, a friend did with a rented moving truck years ago. It wasn’t pretty.